On a photo shoot, it often takes a team of creative collaborators to bring an image to life. Everyone is working together to bring this concept to life, and each person needs to see how their part of the equation is contributing to the whole. 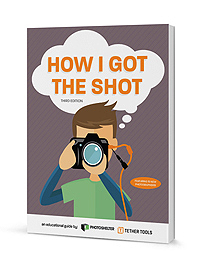 Whether you’re just getting started with tethered photography or looking to take your professional image to the next level, Tether Tools has the gear you need to get there. As a photographer, you’ve likely seen firsthand how working with other talented artists can bring your work to a new level. Tethering is essential to maximize creative collaborations. In addition to working with your assistants, clients are now often requesting contracts that live image preview is available on the day of the shoot. If you’re looking to get started shooting tethered, the easiest way is with the Starter Tethering Kit from Tether Tools. 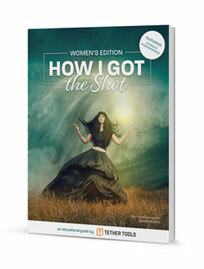 Designed to be the basic package for photographers interested in beginning their tethered photography workflow. TetherPro USB & FireWire cables are premium quality and designed for high capacity photo transfer at fast speed while shooting tethered. Gold plating and ferrite cores reduce noise and signal errors for the most reliable tethering experience. Use our Find Your Cable page to choose the correct cable for your style of camera. JerkStopper Camera Support removes the stress and strain from a cable or cord, ensuring the plug stays in your camera. JerkStopper USB Support removes the stress and strain from a cable or cord, ensuring the plug stays in your laptop. JerkStopper ProTab Cable Ties – Small (10pk) are ideal for thin to medium gauge cables and cords such as A/C, USB, HDMI and music cables up to about 15ft (4.6m) in length. The Cable Organization Case (Standard) is an easily accessible, durable storage case for cables, straps, and JerkStoppers. Keep gear together, the Cable Organization Case fits nicely inside all of the Tether Table Aero Storage Cases. 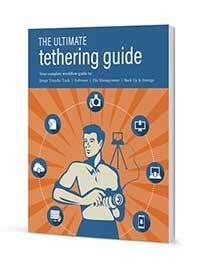 Digital guide recommendation: The Ultimate Tethering Guide covers everything you should consider when setting up your tethering workflow. Download for FREE here. There is a certain aura of professionalism that comes with shooting tethered. You’re respecting your client’s time, you’re producing a higher quality of images, and the result is a satisfied customer. But, if your laptop is laying on the ground, or teetering on a nearby stool you may not be projecting the professional image that you want and hindering your own workflow in the process. 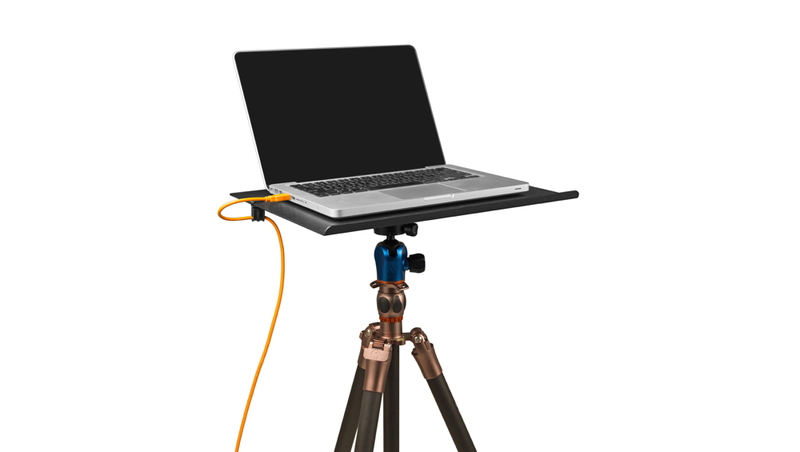 Crafted out of a need for photographers to have a professional workstation when shooting out in the field or in-studio, the Tether Table Aero provides a stable portable tethering platform. The Tether Table Aero mounts to any stand, tripod or arm in just a few seconds, no adapters needed. If you’re shooting tethered using the Starter Tethering Kit or a TetherPro USB Cable, it may be time to upgrade to a Pro Tethering Kit. The Tether Table Aero is designed for the photographer on the go. Whether hiking into a location with a backpack or backed into a corner for a tight architectural shot, the Aero platform footprint can go and be used just about anywhere. Made of T6 Aerospace aluminum, the non-reflective black platform is sleek in design and unsurpassed in stability & durability. The Aero Table comes with the Tether Tools Lifetime Warranty and includes the patented LAJO-4 ProBracket that mounts to any stand that has 1/4″-20 tripod head, 3/8″ tripod mount, 5/8″ stud studio stand or Arca-style mounting attachment. The Tether Table Aero Master is perfect for the studio shooter who has plenty of space, and tons of accessories. Need a spot to put your mouse, phone, lens? The Aero Master has room and then some. The Tether Table Aero Traveler is great for the photographer who’s on the go. Need a laptop table that is lightweight, doesn’t take up too much space but is big enough to hold your laptop? Look no further than the Aero Traveler. Aero SecureStrap fastens your laptop computer to your Tether Table Aero, ensuring it will stay firmly in place. This heavy-duty custom storage bag is constructed of the highest quality pack-cloth material. A zipper closes at the top to protect your table from the elements and bag features handle straps for easy transport. 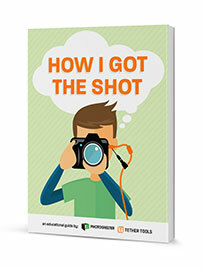 Digital guide recommendation: The How I Got the Shot Series showcases work from incredibly talented photographers who share their final image, a detailed write-up, lighting diagram, and behind-the-scenes video. Download one, or all three of the How I Got the Shot guides for FREE here.